Ok this is just in and was confirmed by Egyptian TV. Egyptian President Mohamed Morsi has issued his orders to recall the Egyptian ambassador Atef Salem from Tel Aviv in a official statement after the latest Israeli aggression on Gaza sector tonight. Morsi has ordered our envy in the UN to call for an urgent meeting for the security council. He also ordered the ministry of foreign affairs to summon the Israeli ambassador in Cairo. He also called Nabil El Araby, the General secretary of LAS in order to held an urgent meeting to discuss the latest developments in Gaza. According from what I understood , The Israeli Ch2 stated that our ambassador in Tel Aviv demanded that the operation in Gaza to be stopped but it seems that the Israeli government has refused and Egypt had to escalate. It is worth to mention that the first official reaction from Egypt was the demand of the ministry of foreign affairs following the strikes demanding Israeli forces to stop the operation. Of course this is a major shift in the relations. Here is the video statement of Presidency's spokesperson Yasser Ali announcing the decisions of Morsi. Here is a quick look to the reactions from Cairo following the aggression on Gaza. Ok Israel has denied that Hamas' rockets reached to Tel Aviv. 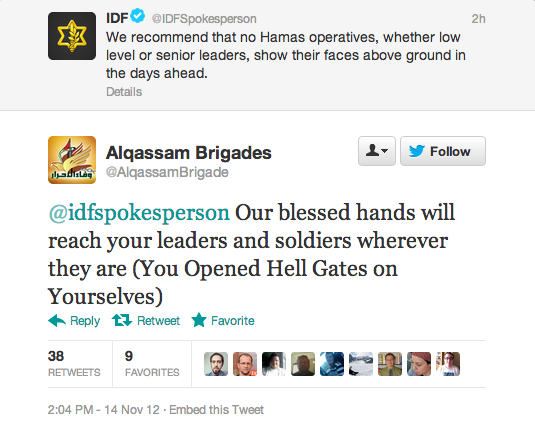 Already Hamas and IDF English Twitter accounts engaged in online fight on the social media network tonight. The State Department has issued a statement and of course the States understands completely the right of Israel to defend itself ..bla bla bla. Israeli ambassador also left Cairo but according to news reports , he went on vacation "summoned for negotiations I bet" yet the embassy is open and working. The ministry of foreign affairs in Egypt changed its header image in its official Facebook Page to a photo showing Palestinian flag. There is unconfirmed news that the Crossings of Rafah are open for injured in Gaza to be transferred to Egypt. The name of that operation is called Operation Pillars of Cloud , oh yes and it has got something with Egypt and the Exodus !! and here we go again. When we exterminate some terrorists there is a big boohaa. BUT when a suicide bomber kills in Iraq 50 peaceful Muslims on Eid al Idha no peep from Egypt. Hypocrites! In the last months the Jihadists and Salafists in Gaza were constantly attacking in rockets and gun fire the Israeli villages across the border with Gaza. These attacks continued even after the "truce" announced 2 days ago. They are not committed to any "truce" with the Zionist entity. 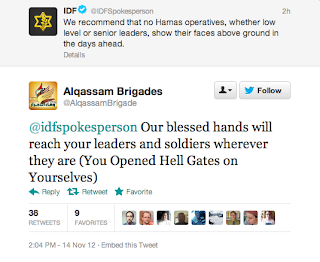 The Hamas people didnt enforce the "truce", and even joined the attacks. I know that you as an Arab consider attacking Jews/Israelis a positive thing, but no government can accept such constant attacks on its population without retaliation. Egypt is fighting Jihadist terror from Sinai fuelled by weapons from Gaza. Its neighbor is fighting Jihadist terror from Gaza (which is not longer occupied by the neighbor). There is nothing to be gained by putting the blame on one side only. Of course, it will make a convenient excuse for forgetting what's going on inside Egypt and getting a million people to Tahrir united in their hatred. Yet another diversion from economic, social, political and many other disasters faced by Egyptian authorities to help cover up their helplessness and incompetency!!!!! Have these people spoken out as forcefully against the violence in Syria - where about 30,000 civilians have been slaughtered by Bashar Assad? Muslims think they are worth more than Jews, so when Jews are attacked by them, their brothers don't care. But when Jews fight back and fight back hard all Muslims do is whine and threaten. They are Nazis wearing hijabs and holding the Koran. Same hateful fascists. Jewish civilians and babies are like vermin to them, but when their civilians are killed they are human beings. Muslims and Arabs are the worst. Back stabbing, dishonest hypocrites. May Allah curse you all.